In a previous post I blogged how to get the combination of Nokia N73 bluetooth Vodafone and 3g going. 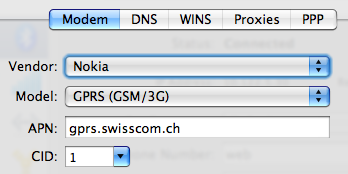 I find myself in Switzerland for a couple of weeks, so I needed to repeat using Swisscom. Through roaming I could just connect, but then there would be a very high data cost. So I got a Swisscom sim and put that in my N73. The first thing that happened was that I got about 15 SMS messages telling me how to set up my phone for Swisscom. Well that was not required. 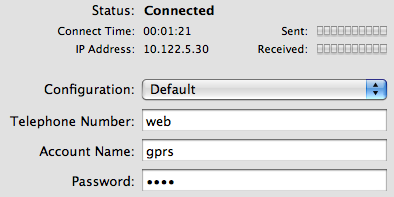 So I hunted around to see what the dial-up settings are. I couldn't find any at all. Click OK, then Apply and then Connect and you should be good to go. Thanks for the post - but I'm afraid it didn't seem to work with my MacBook/HTC Touch HD/Swisscom. If I find a solution for my phone I will post it in my blog. In what way doesn't work? Doesn't connect, or connects but no data flow? Thanks for hte info!!! it worked beautifully for me!! !